The wagner paint sprayers provide an innovative and smarter way of painting. They combine control and power to give you full coverage, smooth finishes, consistent, and impressive results like professional painting sprayers you buy on the market. They can be used by DIY enthusiasts for both outdoor and indoor surfaces. They fall into the several categories of Wagner products that include Flexio, HEA, Control, Airless, Motocoat, PaintReady, and Craft series. The Flexio spray gun provides 10 times faster results than a painting brush. The HEA (High-Efficiency Airless) technology guns offer you a softer spray, improved control, and more consistent finish. The control guns are ideal for trim painting and staining and give a quick even finish. 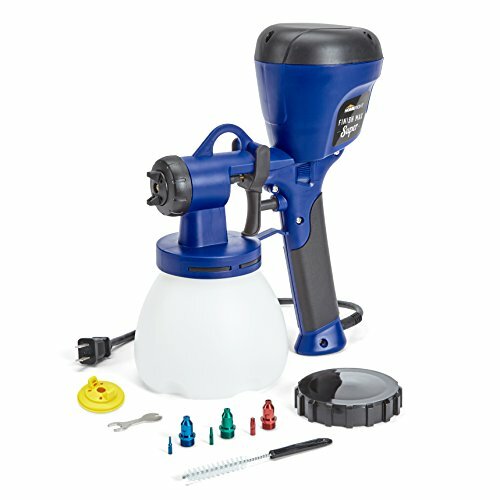 The craft gun is can be used for craft projects to spray chalk type paints, milk paints, and other decorative paints. Below you will find our selection of the best Wagner paint sprayers for sale today. The sprayer’s air cap adjusts in three different positions to enable you to spray in either horizontal, vertical or diagonal pattern. At 40 CFM, this unit offers an air pressure of 4 PSI whose capacity to apply materials stand at 4.1 oz. per minute. You can spray a number of paints, lacquers, primers, and stains using its Control Spray Max. The turbine is placed within the X-Boost Power Box to reduce fatigue during use as the weight is placed on the floor. The Wagner 0518050 spraying gun is not only a powerful sprayer but also quite easy to use. It has been cleverly designed to tackle any painting task and is very reasonably priced. It uses HVLP technology and comes with three spray patterns to give you maximum control. There is a variable control trigger that has patterns between 1 to 10 inches for spraying light materials with low overspray. It has a lock-n-go technology that allows for quick change of materials and faster painting. The use of HLVP technology enables this sprayer to paint thin materials like sealers, stains, urethanes, lacquers, and vanishes. A two-stage air turbine rated for both indoor and outdoor tasks enables a continuous flow of air and materials to produce a professional fine finish. 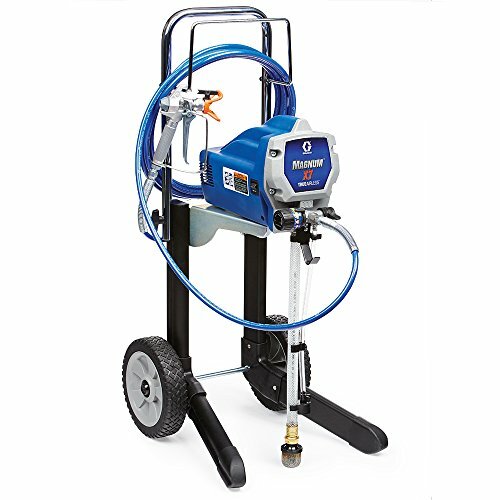 This is one of the fine airless paint sprayers in the market that comes with very few parts making it easy to clean and maintain. All you need to have for cleaning purposes is some soapy water for the latex parts and some mineral spirits for the oil-based components. The sprayer’s air cap adjusts in three different positions to enable you to spray in either horizontal, vertical or diagonal pattern. By aligning the air cap in a horizontal manner, you are able to achieve a high and oval spray pattern. By aligning the air cap in a vertical manner, you are able to achieve a broad and oval spray pattern. The circular pattern is achieved by aligning the air cap in a diagonal manner. The variable trigger enables you to control the material flow and spray in patterns of between 1/2 to 10 inches wide. Setting it up takes less than 5 minutes while cleaning it up takes less than 10 minutes. Two air filters have been attached to the unit to improve its functionality and enable it to paint with high accuracy. This is the most popular handheld paint sprayer that comes with two material cups. The first cup is for smaller interior works and its capacity is 1 quart. The second cup has a capacity of 1.5 quarts and is suitable for handling large exterior tasks. The coverage for this unit is 4.9 Fl.oz. per minute. The popularity of this unit stems from the fact that it combines a variable flow control and a 570 watts two-stage turbine. This combination gives it the ability to spray different viscosity liquid in both thin and thick materials. 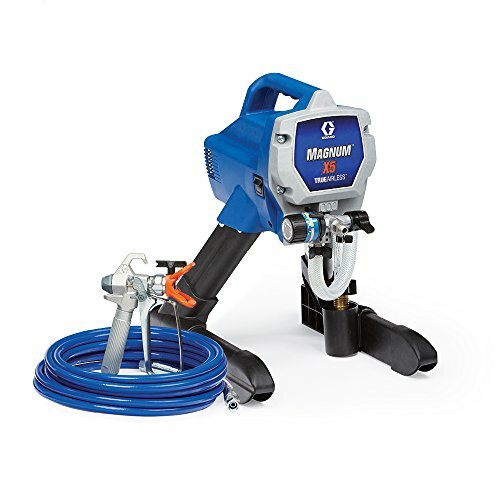 This is one of the best-selling sprayer models from Wagner and a perfect tool for accomplishing small painting tasks. It is HVLP technology powered painting spray gun gun that can be used to spread thin materials such as deck stain and wood sealers. Its spray tip can adjust in 3 different positions to give you maximum spray control. The three positions result in three spray patterns of horizontal, vertical, and round. It comes with a variable flow control that lets you adjust the material size and flow rate. Having been made from a light plastic material, it is quite convenient to use. Setting it up takes only 5 minutes or less while cleaning it up can be done in less than 10 minutes. In less than 20 minutes, you can, therefore, get your job done and the machine cleaned. It works well for small tasks like kid’s furniture, grills, and railings. The simplicity of setting it up is highlighted by the fact that there is an intake opening that allows you to input the suction tube once you’ve prepared your materials. At 40 CFM, this unit offers an air pressure of 4 PSI whose capacity to apply materials stand at 4.1 oz. per minute. It uses the High Volume Low Pressure (HVLP) technique to spray thin materials like sealers, stains, urethanes, lacquers, and vanishes. One of its key features is the outdoor rated turbine that uses that ensures a continuous flow of air and materials. Its filters can be easily replaced to protect your paint from external particles. The changing of components has been made easy using the Lock-n-Go technology from Wagner. A plastic cup of one-quart capacity has been included in this unit. A viscosity cup is also included. The product weighs 3.4 pounds which is light enough to minimize the level of fatigue during work and the paint sprayer is for less than $100. 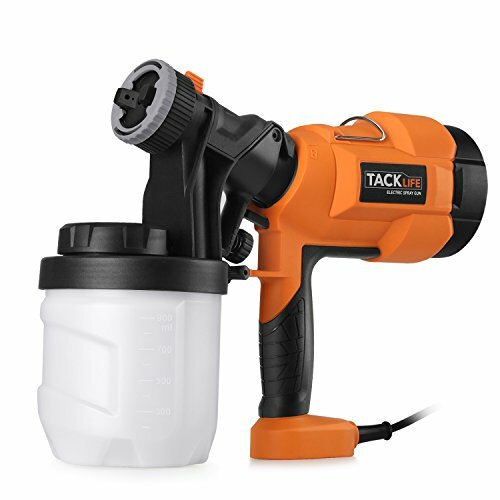 This is a great sprayer for carrying out finishes on deck railings, playsets, lawn furniture, grills, and kid’s furniture. The Wagner 0518080 is a one of the best multi-purpose and multi-dimensional turbine paint sprayer that works well for simple and small home-based painting tasks. 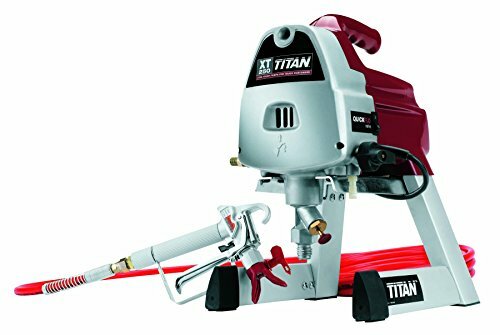 It combines a number of excellent features such as variable air pressure control, two-stage powerful turbine, and a metal spray gun. These features make it easy to paint thinner materials like stains & lacquers and larger ones like surfaces & walls using latex paints. Its versatility is provided by the three spray patterns while its 20-foot hose allows for an extended reach. It uses a two-stage turbine for staining and painting projects. You can spray a number of paints, lacquers, primers, and stains using its Control Spray Max. Some of the projects you can use this unit include the painting of the door trim, decks, paint & prime cabinets, and staining of furniture, and other woodwork projects. The turbine has enough power to handle thick materials. The sprayer has a variable flow control that allows you to move from working on a large surface to a more detailed oriented surface like windowpanes. 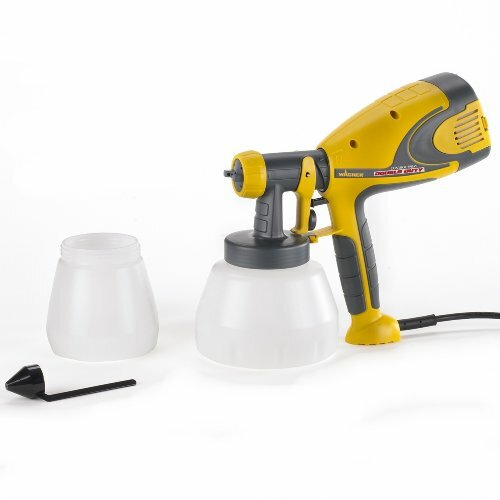 A powerful HVLP turbine of 570 watts is included to enable you to spray liquids of different viscosity and handle both thin and thick materials. Depending on the nozzle alignment, you can spray three different patterns. The three alignments are diagonal, horizontal, and vertical air caps. The diagonal air cap, for instance, gives you a circular symmetrical spray pattern. 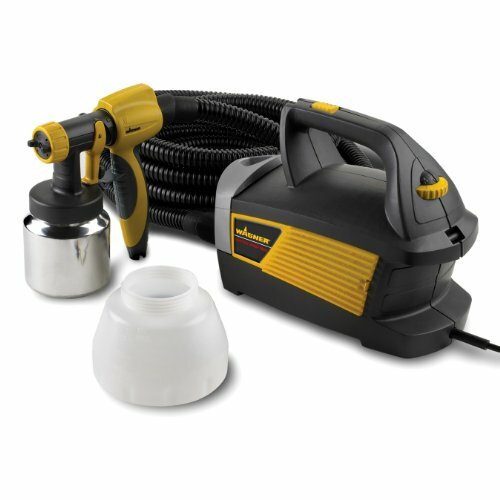 The variable control feature reduces the problem of overspray when dealing with thin materials like liquor and stains. The air pressure can be adjusted between 1.50 and 2.63 PSI to allow for the paint atomization depending on the nature of the job. A plastic 1.5-quart cup is included to handle large-scale projects and a professional grade cup is also included to tackle small-scale applications like fine finish. This powerful and lightweight machine can be set up in minutes and features a viscosity cup for measuring the material density. There are two large filters for preventing dust and give you a smooth and even finish. Cleaning and maintaining it is quite easy as you can use soapy water on latex materials and mineral spirits on oil-based materials. The Wagner FLEXiO 890 sprayer is an outdoor and indoor portable paint system that comes with an integrated storage. It is a great option for handling most household painting projects if you are familiar with some guidelines on painting sprays. It can be easily set up and has a number of adjustment options for precise control and quicker cleanup. The unit comes with an innovative iSpray nozzle that is extremely durable and covers a wide range of surfaces. It also has Detail Finish nozzle that enables you to reach small and hidden spots during painting. The X-Boost turbine for this machine is able to create unmatched spraying power while providing adjustable controls, low overspray, and full coverage options for the user. The turbine is placed within the X-Boost Power Box to reduce fatigue during use as the weight is placed on the floor. Also fitted within the power box are the nozzle, integrated power dial, and the 11.5-foot hose. When you purchase this product, you get an opportunity to complete smaller and larger projects like interior painting and fine finishing much faster. Its capacity to spray unthinned paints give it the maximum versatility required of a Wagner paint sprayer. Most customers love this unit because of its ability to use regular undiluted paints. 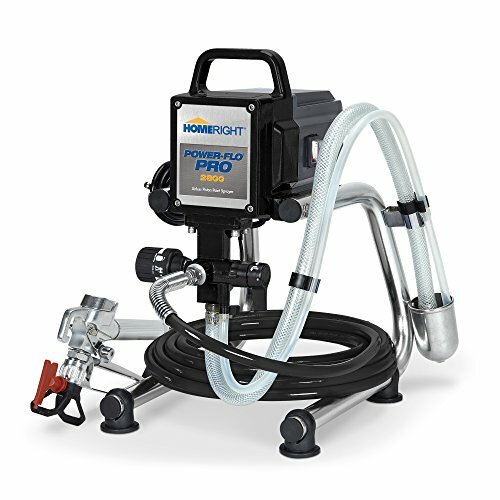 With this sprayer, there is no need to dilute the paint or buy specialty paints. Most primer brands are also able to work with the Flexio 890 unit. Its protective exhaust is quite powerful and may easily leave paint even in unwanted places. It is therefore important to tape a protective cover on unwanted spraying areas when using this sprayer. Two spray nozzles are part of this machine. The two nozzles don’t have wearable parts and are extremely durable. You can obtain a professional look for your painting based on a combination of the adjustable spray pattern, width, and adjustable material flow. The unit is able to spray 8.4 GPH to cover a wall of about 8 by 10 feet in just 5 minutes using unthinned latex paint. The adjustable trigger enables you to control the flow of materials. The iSpray nozzle features a 1.5-quart cup while the Detail Finish nozzle features a 20 Fl.oz. cup. The nozzle and the gun are separated using a Lock-n-Go feature and this enables easier cleaning of the unit and quicker material changes. This is an outdoor and indoor paint station that can be used on all surfaces. The wagner paintREADY machine includes advanced features such as the iSpray Nozzle spraying technology that allows spraying of unthinned outdoor and indoor paints. The iSpray nozzle works well on a broad range of surfaces and uses unthinned latex paint to deliver a roller-like finish. It can be used on a longer task without causing much fatigue because of its 15-foot hose and a turbine base. The unit can be adjusted to meet the requirements of any project and work with any material. It has a Lock-N-Go feature that enables easier material changing as well as cleaning. The unit weighs 10.4 pounds and has dimensions of 15.5 by 14 by 11 inches. Its compact design makes it easy to use. 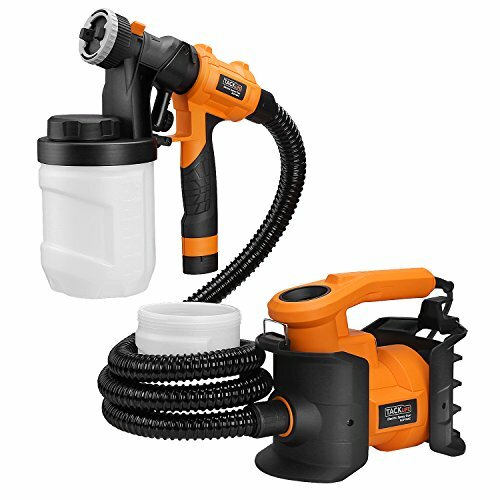 It is an ideal sprayer for DIY interior and exterior projects. You can use it to spray latex, acrylic, water-based paints, urethanes, lacquers, and varnishes. The Pattern adjustment for this unit can be either horizontal or vertical. It can also be wide or narrow depending on the alignment of the air cap. These patterns are perfect for staining fences and decks. It is also ideal for painting doors, walls, ceilings, and other woodworking projects. The Wagner PaintREADY Station enables you to cover broad surfaces by spraying up to 15 ounces per minute. There is an adjustable trigger that allows you to control the output flow of materials. To adjust the air pressure level, an airflow control knob has been included. This knob allows you to choose the right settings to achieve the desired results, all these procedural techniques should be looked upon through manuals for how to use a paint sprayer . The separation of the turbine from the spray gun allows the machine to maneuver freely during work. Also included is the 1.5-quart cup ideal for mid-sized staining or painting projects. Just like other Wagner products, this sprayer is a leader in its category as far as outdoor and indoor painting is concerned. The Wagner FLEXio 590 unit is a portable HVLP hand-held tool ideal for both indoor and outdoor painting projects and for exterior wall painting this could be right choice to choose. 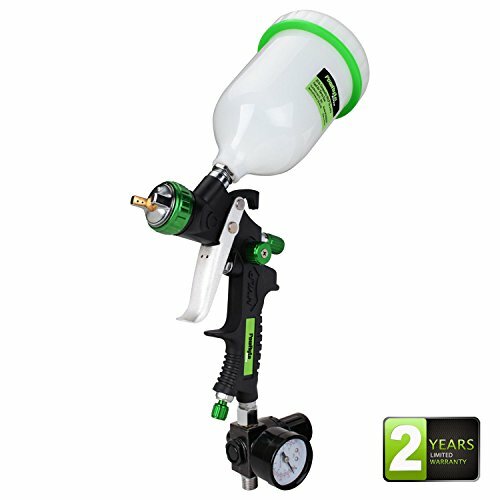 It’s a lightweight sprayer that is mostly recommended for small painting jobs. This kit gives you the flexibility and the power to handle any exterior surface project, interior wall projects, and fine finishing. It has two patented technologies that provide this much-needed power. The two technologies are the iSpray nozzle and the X-Boost turbine. The unit looks like a complicated equipment but is quite easy to use. The three parts that make up the machine are quite easy to assemble and can be used immediately after they have been unpacked. It’s 50 percent more powerful than most sprayers in its price range and 20 percent lighter. A rotating cap has been included to provide you various adjustments for the pattern and arc width. The trigger works in two stages. In the first stage, it is pulled to a certain point to activate the turbine. The second stage then involves pulling it further to activate the material injection. With this product the edges and corners could be painted efficiently resulting in saving of time with the paint sprayer in multiple painting projects. Th X-Boost Power Dial is one of its key features and with this technology you will be able to adjust the air pressure level generated by the motor. It has been set to maximum as the default value and this ensures a high-power level for smoother finishes and faster coverage for the thicker materials. You can lower the air power, but this results in rougher finishes. The kit comes with a knob for controlling the material flow. This knob helps you determine the paint amount that is pushed through the nozzle. You can tighten it to reduce the flow by shutting the inner valve. This feature helps in reducing overspray, especially when handling small projects. One feature that is unique to this sprayer is the Detail Finish Nozzle. This feature turns a simple painting project into a masterpiece by boosting the fine finish details. For proper maintenance, ensure you acquire the right solution for cleaning the different types of paint. For latex paint, warm soapy water is sufficient to get the cleaning done. The reservoir is not very complicated as it can be simply rinsed with water. It is generally a great unit for professionals and DIY enthusiasts. There are many reasons that can make you want to buy a Wagner spray gun. One of the reasons is the convenience of painting. Wagner products are known for having features like the tilt technology which enables you to paint from any angle. This feature makes it quite convenient for both small and large-scale projects. The Wagner models are quite affordable, and this may inspire you to acquire them for your painting needs. Their innovative features will give you a chance to paint with a lot of professionalism. Picking out the best spray gun from Wagner is not an easy task. There are a number of factors and features you need to put into consideration. To start with, most painting projects require comprehensive guide on suitable paint sprayers. It is therefore important to consider which one has the level of control required for your project. If you are going to handle a large project, then a Flexio spray gun would be ideal because of the many controls it comes with. The airless model gives you variable settings to enable you to control the spray fan width. A narrow width will give you more details while a larger width will have more coverage. It is therefore important to look at the control features offered by the different Wagner guns so that you choose one that suits your requirements. 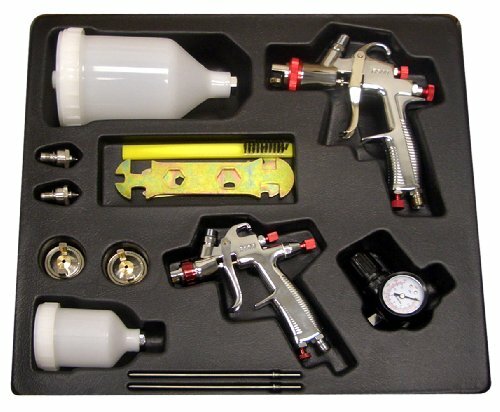 The next aspect to consider is the features that come with these spray guns. Models have various features giving them different levels of versatility. A feature like X-boost dial enables smoother finishes and faster coverage even for thick materials. There are other features like adjustable nozzle, flow control knob, holding capacity, and horsepower are important features. Some models give you the ability to adjust the spray direction as well as the spray fan size. In order to get the best product, it is always good to spend more time exploring the various features of each model. By considering the type of paints and projects you will be handling, you will be in a better position to get a model that addresses your needs. The other factors to keep in mind include horsepower capabilities, flexibility, portability, volume, and cleaning. For the horsepower capabilities, you need to think about the amount of pressure required to meet your painting obligations. If you are going to paint a house using a Wagner spray gun, then it is important to go for a unit with a higher pressure. You also need to think about the number of times you need to refill your tank while working. This will help you get a unit with the right volume capacities for your projects. Paint cleaning can be quite a headache especially if your gun doesn’t have the right cleaning tools. You should choose a spray gun that can be easily cleaned for proper maintenance and long-lasting use. You then have to consider the model that is flexible enough to handle stains, lacquers, and latex paints. The top paint spray guns is out there on the market and sometimes it is the lack of information that acts as a barrier to getting it. In this article, we have presented information that should be able to help you overcome this barrier. Most people like Wagner spray guns because of their versatility and affordability. They are sturdy, durable and quality products, having been made from high-quality materials. As a reminder, choosing the top-rated Wagner sprayer involves balancing the various factors highlighted and the cost of the product. You need to know the type of product you are going to work with and the size of your painting project. These factors notwithstanding, it is important to buy a unit that fits your budget and needs.